Inactive Ingredients: Artificial Raspberry Flavor; Citric Acid, USP; FD&C Red No. 40; Liquid Sugar; Propylene Glycol, USP and Purified Water, USP. It may also contain Sodium Citrate, USP. Glucocorticoids are adrenocortical steroids, both naturally occurring and synthetic, which are readily absorbed from the gastrointestinal tract. Naturally occurring glucocorticoids, (hydrocortisone and cortisone), which also have salt-retaining properties, are used as replacement therapy in adrenocortical deficiency states. Their synthetic analogs, including dexamethasone, are primarily used for their potent anti-inflammatory effects in disorders of many organ systems. Drug-induced secondary adrenocortical insufficiency may result from too rapid withdrawal of corticosteroids and may be minimized by gradual reduction of dosage. This type of relative insufficiency may persist for months after discontinuation of therapy; therefore, in any situation of stress occurring during that period, hormone therapy should be reinstituted. If the patient is receiving steroids already, dosage may have to be increased. Since mineralocorticoid secretion may be impaired, salt and/or a mineralocorticoid should be administered concurrently. Corticosteroids may mask some signs of infection, and new infections may appear during their use. There may be decreased resistance and inability to localize infection when corticosteroids are used. Moreover, corticosteroids may affect the nitroblue-tetrazolium test for bacterial infection and produce false-negative results. In cerebral malaria, a double-blind trial has shown that the use of corticosteroids is associated with prolongation of coma and a higher incidence of pneumonia and gastrointestinal bleeding. Corticosteroids may activate latent amebiasis. Therefore, it is recommended that latent or active amebiasis be ruled out before initiating corticosteroid therapy in any patient who has spent time in the tropics or any patient with unexplained diarrhea. Since adequate human reproduction studies have not been done with corticosteroids, use of these drugs in pregnancy or in women of childbearing potential requires that the anticipated benefits be weighed against the possible hazards to the mother and embryo or fetus. Infants born of mothers who have received substantial doses of corticosteroids during pregnancy should be carefully observed for signs of hypoadrenalism. Corticosteroids appear in breast milk and could suppress growth, interfere with endogenous corticosteroid production, or cause other unwanted effects. Mothers taking pharmacologic doses of corticosteroids should be advised not to nurse. Administration of live virus vaccines, including smallpox, is contraindicated in individuals receiving immunosuppressive doses of corticosteroids. If inactivated viral or bacterial vaccines are administered to individuals receiving immunosuppressive doses of corticosteroids, the expected serum antibody response may not be obtained. However, immunization procedures may be undertaken in patients who are receiving corticosteroids as replacement therapy, e.g., for Addison's disease. Persons who are on drugs which suppress the immune system are more susceptible to infections than healthy individuals. Chickenpox and measles, for example, can have more serious or even fatal course in non-immune children or adults on corticosteroids. In such children or adults who have not had these diseases, particular care should be taken to avoid exposure. How the dose, route and duration of corticosteroid administration affects the risk of developing a disseminated infection is not known. The contribution of the underlying disease and/or prior corticosteroid treatment to the risk is also not known. If exposed to chickenpox, prophylaxis with varicella zoster immune globulin (VZIG) may be indicated. If exposed to measles, prophylaxis with pooled intramuscular immunoglobulin (IG) may be indicated. (See the respective package inserts for complete VZIG and IG prescribing information.) If chickenpox develops, treatment with antiviral agents may be considered. The use of Baycadron™ Elixir in active tuberculosis should be restricted to those cases of fulminating or disseminated tuberculosis in which the corticosteroid is used for the management of the disease in conjunction with an appropriate antituberculous regimen. Following prolonged therapy, withdrawal of corticosteroids may result in symptoms of the corticosteroid withdrawal syndrome including fever, myalgia, arthralgia, and malaise. This may occur in patients even without evidence of adrenal insufficiency. Steroids should be used with caution in nonspecific ulcerative colitis, if there is a probability of impending perforation, abscess, or other pyogenic infection, diverticulitis, fresh intestinal anastomoses, active or latent peptic ulcer, renal insufficiency, hypertension, osteoporosis and myasthenia gravis. Fat embolism has been reported as a possible complication of hypercortisonism. When large doses are given, some authorities advise that corticosteroids be taken with meals and antacids taken between meals to help to prevent peptic ulcer. Phenytoin, phenobarbital, ephedrine, and rifampin may enhance the metabolic clearance of corticosteroids, resulting in decreased blood levels and lessened physiologic activity, thus requiring adjustment in corticosteroid dosage. These interactions may interfere with dexamethasone suppression tests which should be interpreted with caution during administration of these drugs. The prothrombin time should be checked frequently in patients who are receiving corticosteroids and coumarin anticoagulants at the same time because of reports that corticosteroids have altered the response to these anticoagulants. Studies have shown that the usual effect produced by adding corticosteroids is inhibition of response to coumarins, although there have been some conflicting reports of potentiation not substantiated by studies. When corticosteroids are administered concomitantly with potassium-depleting diuretics, patients should be observed closely for development of hypokalemia. Reports of acute toxicity and/or death following overdosage of glucocorticoids are rare. In the event of overdosage, no specific antidote is available; treatment is supportive and symptomatic. 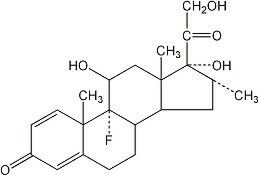 The oral LD50 of dexamethasone in female mice was 6.5 g/kg. DOSAGE REQUIREMENTS ARE VARIABLE AND MUST BE INDIVIDUALIZED ON THE BASIS OF THE DISEASE AND THE RESPONSE OF THE PATIENT. The initial dosage varies from 0.75 to 9 mg a day depending on the disease being treated. In less severe diseases doses lower than 0.75 mg may suffice, while in severe diseases doses higher than 9 mg may be required. The initial dosage should be maintained or adjusted until the patient's response is satisfactory. If satisfactory clinical response does not occur after a reasonable period of time, discontinue Baycadron™ Elixir and transfer the patient to other therapy. After a favorable initial response, the proper maintenance dosage should be determined by decreasing the initial dosage in small amounts to the lowest dosage that maintains an adequate clinical response. Patients should be observed closely for signs that might require dosage adjustment, including changes in clinical status resulting from remissions or exacerbations of the disease, individual drug responsiveness, and the effect of stress (e.g., surgery, infection, trauma). During stress it may be necessary to increase dosage temporarily. If the drug is to be stopped after more than a few days of treatment, it usually should be withdrawn gradually. Give 1 mg of Dexamethasone orally at 11:00 p.m. Blood is drawn for plasma cortisol determination at 8:00 a.m. the following morning. For greater accuracy, give 0.5 mg of Dexamethasone orally every 6 hours for 48 hours. Twenty-four hour urine collections are made for determination of 17-hydroxycorticosteroid excretion. Test to distinguish Cushing's syndrome due to pituitary ACTH excess from Cushing's syndrome due to other causes. Give 2 mg of Dexamethasone orally every 6 hours for 48 hours. Twenty-four hour urine collections are made for determination of 17-hydroxycorticosteroid excretion. Store at 20° to 25°C (68° to 77°F). [See USP Controlled RoomTemperature].